What backpacking outings make a young Scout really want to get back on the trail? I’m posting some of my favorites from my area, the southern part of the San Francisco Bay area. These work as anyone’s first backpacking trip, but emphasize group camping areas and short, fun trips. Manzanita Ridge at Henry Coe State Park. Also check out the pages for The Pine Ridge Association, the volunteers who support Henry Coe SP. Manzanita Point has ten group camps stretched out along the end of the road. They all have their advantages, but don’t underestimate the sites at the end of the road (8, 9, and 10). Fees are $75/night for up to 50 people, which includes parking for five vehicles. It is $8 per night for each additional vehicle. When camping at Manzanita Point, you are allowed to drive in two equipment vehicles. You are not allowed to shuttle campers back and forth to the campsite; campers must walk or bicycle to the campsite. The road to the campsites is a ranch road, dirt, with ruts, and steep in places. I’ve driven it a couple of times in regular vehicles (a station wagon and a minivan), but it can get tricky when wet. Watch the rain forecast or bring a 4WD vehicle with an experienced backcountry driver. The sites do not have water or trash service, so you will need to bring your water in and your trash out, either with vehicles or backpacking. One year, we were planning to drive the trash out, but it rained. I packed out the wet trash, trailing behind the troop. I weighed it when I got home — 52 pounds. There are some springs at Coe, but you’ll need to check at HQ to see whether they are running. I would not rely on them. There are three trail options for the middle part of this trip. The Springs Trail and the Forest Trail have less elevation change and go through meadows and forest, respectively. The fire road follows the top of the ridge, so it has more up and down, but some lovely views. A good option is to go to the campsite on the ridge, then choose either the Springs Trail or the Forest Trip for the trip back to headquarters. This photo is from the ridge road. I’m pretty sure I took this standing in front of the Sada Coe pine. This hike has a number of opportunities for plant and wildlife identification. It is common to see wild turkeys, areas where wild pigs have been rooting, an acorn woodpecker granary tree, pocket gophers, owl pellets, and so on. The three-way trail junctions (Springs, Forest, and Ridge Trails) are good opportunities for map and compass navigation. Henry Coe is hot and dry in the summer, and the ranch road to the campsite is slippery in the rain, so this is best in late spring or fall. Winter is nice, too, as long as the road is dry (for driving to the campsite). The wildflowers usually bloom a little earlier here, so it can be lovely in late winter or early spring. There are some nice trail maps online and you can buy an excellent map of the whole park at the headquarters. You can also order the Henry Coe map from The Pine Ridge Association. They often have patches, too. That’s great, because we know it is Scouting when there is a patch. There is also a car camping site at HQ with 19 sites. We used that for a Scout Skills weekend, with a five (and a bit) mile hike to Manzanita Point and back. 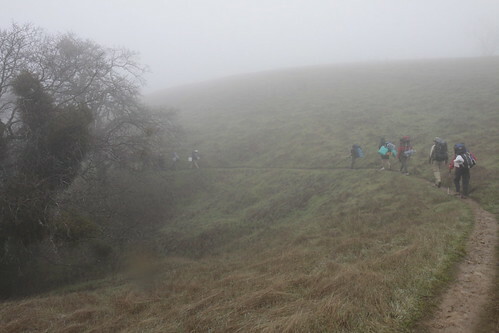 If you want challenging hikes, Henry Coe has those too. You get deep into the park by crossing a series of very steep north-south ridges. 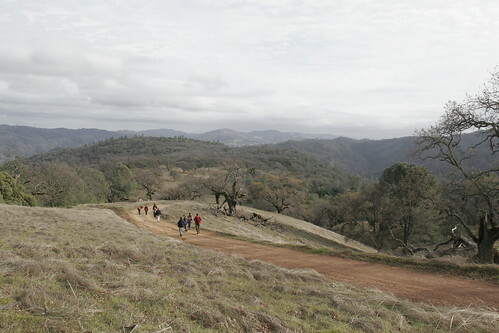 There are not many people in the interior of Henry Coe State Park and it is a big park. You could do a 50 miler into the Orestimba Wilderness.